Fresh donut holes are the secret ingredient to this perfect ending to a summer meal. Swing by your favorite shop before preparing and find them as fresh as possible. Stir together orange liquor and vanilla pudding. Fold in whipped topping until well incorporated but still fluffy. Place half of the donut holes in the bottom of a trifle dish or deep casserole dish. 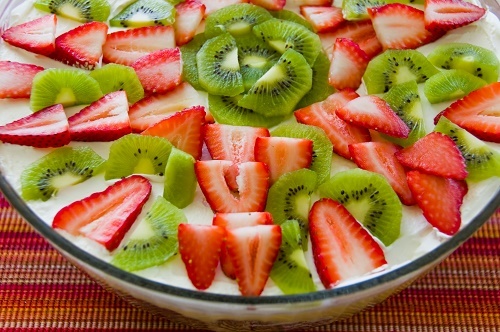 Top with ½ of the pudding mixture and strawberries, orange segments, and kiwis. Layer remaining donut holes on top of fruit, and finish with remaining pudding mix. Mix and match this recipe based on what you have on hand. Try switching the vanilla pudding for strawberry yogurt, exchanging the kiwis for banana slices, and substituting strawberry banana juice for the orange liquor.